I'm a pop culture icon! Not really. 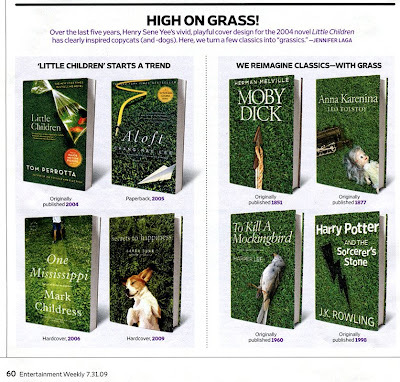 But Entertainment Weekly Magazine mentioned how my cover design for Tom Perrotta's novel Little Children with it's green lawn background inspired copycat covers. If it's true, I'm flattered. But the kid is not my son. Although their mock cover for Leaves of Grass IS pretty brilliant. 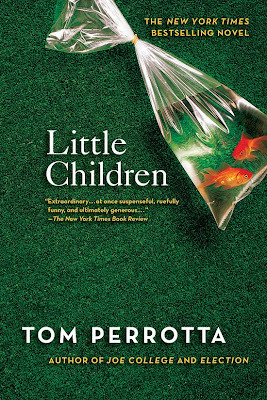 You can read a bit about the controversy surrounding the HC edition of Little Children with its Goldfish cracker cover that I was forced to change. Which I thought was perfect for the story. I absolutely loved the HC version that you did and that probably spawned many children of its own. Each really good and innovative cover influences the next season, or few, and that's one of the great things about the melting pot of design. Give yourself a pat on the back Henry, you deserve it!